Fox Entertainment released another clip of the highly anticipated film ‘The Fault In Our Stars’ yesterday. The clip is from the scene Hazel and Gus go on their first date. Shailene Woodley will star as the female lead Hazel and Ansel Elgort plays the male lead Augustus. If you haven’t already read the incredibly popular novel ‘The Fault In Our Stars’, it’s okay, Hazel and Gus will still steal your heart this Summer! The novel is about two extraordinary teenagers who are quirky, unconventional, and share a love that sweeps them–and fans–on an unforgettable journey. ‘The Fault In Our Stars’ based on the heart-breaking #1 New York Times best-selling young adult book will be in theaters in just a few more weeks! The following for John Green, Author of the best-selling young adult novel ‘The Fault In Our Stars’, has become massive. He constantly communicates with fans through his personal Tumblr, Instagram, and Twitter. Often giving fans the inside scoop of everything that’s been going on with the film–many times joking around with them and assuring fans that everyone involved in the film was committed to making it as close to the novel as possible. He clearly understands how important it is for invested fans of the novel! In 2012 Fox Entertainment bought the film rights for ‘The Fault In Our Stars’ and fans went crazy when they heard the news of a movie in the works. In 2013, John Green himself posted to his blog that the movie would be directed by Josh Boone and shared with his fans how excited everyone was. 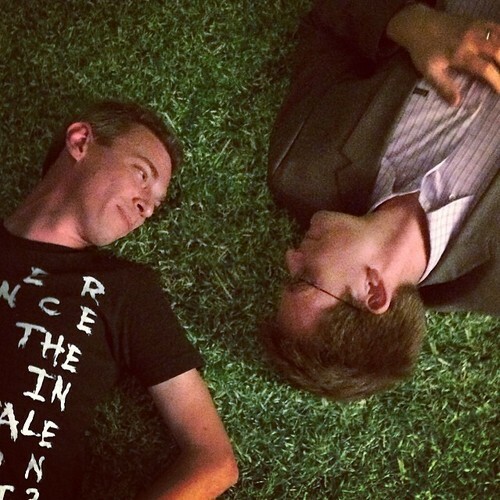 John Green, Author of #1 best-selling novel ‘The Fault In Our Stars’, posts on Instagram a photo of him and Director Josh Boone recreating the movie’s poster. John Green’s popular young adult books like ‘Looking For Alaska’ quickly became a cult classic for teens but without a doubt the heart-wrenching, ambitious story of Cancer patients Hazel and Gus in ‘The Fault In Our Stars’ have managed to create such a insane following, instantly making it one of the most highly anticipated movies of the summer, coming to theaters June 6th! If you haven’t watched the official full trailer, grab some tissues (haha) and check it out below!